Apples in addition to being tasty treats, provide nutritional benefits to your dog. They offer vitamin C and dietary fiber, and they are low in sodium and saturated fat. They contain calcium and phosphorus, and they also add to a dog’s skin and coat health by adding omega-3 and omega-6 fatty acids to your dog’s diet. Dogs with sensitive digestion are said to tolerate apples well. Apples with the skin on are full of plant chemicals (phytonutrients) that are thought to be protective against some types of cancer. Carrots especially when processed (baked or dehydrated) to boost the ability to ingest, are definitely the most nutrition rich veggie available to dogs right now. The natural benefits to carrots are the vitamins that it contains (Vitamin A, C, D, E, K, B1 and B6). Not only do carrots bring in nutritious anti-oxidants to your canines eating habits, they also are rich in insoluble fibers which commonly boost digestive tract wellness in your animal. Carrots also provide distilled natural oils to naturally guard your dog from worms. Brown Rice is less likely to cause allergy symptoms in your dog. It is a good source of the mineral selenium which has been found to reduce the incidence of cancer and cataracts. Brown Rice contains magnesium which plays a major role in maintaining bodily nerves, bones and muscles and is necessary for sustaining a normal heart beat. Brown Rice is also rich in vitamin E which promotes immunity and is necessary for a healthy skin in dog. Handy Tip: Oat Flour can be made by grinding rolled oats in a food processor, blender or vita mixer until it is the consistency of flour. Preheat oven to 170° C (340° F) and line 2 cookie trays with parchment paper. Combine all ingredients in a large bowl. Mix thoroughly to form rounded dough ball. (If dough appears a little sticky, work in a little extra Oat flour). Turn dough out onto floured work surface and knead gently for about one minute. Roll dough to about ¼ to ½ inch thickness and using a cookie cutter or a sharp knife, cut out shapes and place on to cookie trays. Place cookie trays in oven and bake for 45-50 minutes. Remove from oven, turn cookies over and allow to sit on cookie tray for 5 minutes. Place cookies on a wire cooling rack to completely cool. Yield: about 60 small to medium size cut out cookies. Store in zip lock bags or air tight containers in your refrigerator. Allow to come to room temperature before feeding. Feed these Apple Carrot and Brown Rice Cookies only as a treat. Carrots are an excellent source of antioxidants and phytonutrients, which are thought to help protect the heart and reduce the risk of cancer. Carrots are naturally high in beta carotene, an antioxidant, which protects against cell damage by soaking up free radicals. Clinical trials have shown that dogs supplemented with beta carotene have a heightened immune response, which protects them from illness and infection. Cheese is a good source of protein for your dog. It also provides vitamins and minerals, such as calcium, Vitamin A, B-complex vitamins and essential fatty acids. Low Fat Cheddar Cheese has less lactose (milk sugar) than milk and some other dairy products so it’s less likely to cause digestive problems plus, not all dogs are lactose intolerant. According to the ASPCA site, if you use only a small amount of low-fat cheese in homemade treats and your dogs don’t have any digestive upset, you can use it. Parsley is a great addition to your dog’s food bowl. It inhibits cancer, is a rich source of vitamins, minerals, chlorophyll and enzymes. It acts as a tonic, meaning it helps to boost the body’s overall functioning, clearing the bloodstream and liver of toxins. It also acts as a diuretic so it’s great for dogs who are prone to kidney and bladder infections, incontinence, and arthritis. It can help improve bad breath in dogs! Note* – You can use use whole meal (whole wheat) flour. Pre-heat oven to 180° C (350° F) and line a cookie tray with parchment paper. Mix together the flour, grated cheese, carrot & parsley and oil in a bowl. Add the milk in small amounts until the mixture comes together to form a dough. Turn dough out on to a lightly flour worktop and knead lightly. Roll out the dough to about 1/4 inch thickness and using a cookie cutter of your choice or a sharp knife, cut into shapes and place on to cookie tray. Repeat process of knead, roll and cut until all dough is used. If you like to peek while your cookies are baking, don’t worry too much if they appear spotted with brown ‘bits’, it just the cheese melting on the top of the cookies, as long as the cheese doesn’t burn, it’s good. Remove the cookies from oven and place them on wire cooling rack to cool. Yield about 24 – 30 soft treats depending on size. Store in zip lock bags or air tight containers in your refrigerator – allow treats to come to room temperature before feeding. 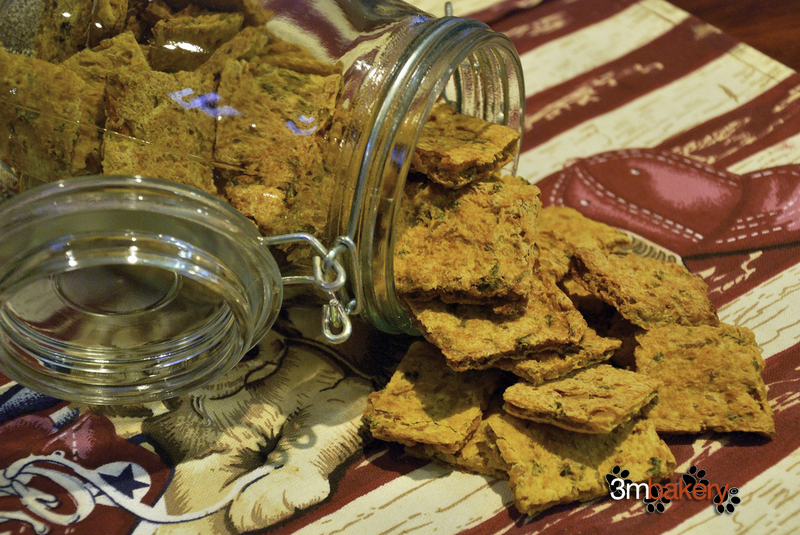 Feed these Carrot Cheese ‘n Parsley Cookies only as a treat. Be sure to check the recipe for any known foods or ingredients your pet may be allergic to. Pumpkin cooked fresh, Pumpkin Seeds (see additional recipe below) and canned pumpkin (unsweetened, not pie filling) have many benefits for dogs. There is good reason pumpkin is often a top ingredient in higher quality kibble. Digestive Health: Pumpkin is a fabulous source of fiber for our fur kids, as well as for us. Pureed pumpkin (with no added sugar or spice) can help dogs with both constipation and diarrhea. Adding a tablespoon or two (in proportion to their size) to their regular meal is known to help keep them regular. It can also help dogs with indigestion or upset stomachs. Urinary Health: The oils in pumpkins’ flesh and seeds are believed to support urinary health. They are also an excellent source of Vitamin A, beta-carotene, potassium and iron, and may even reduce the likelihood your pet will develop cancer. Weight Loss: If you are looking to take a few pounds off of your dog, try reducing a portion of their food and replace it with the same portion of fresh cooked, mashed or canned pumpkin. Their tummy will feel just as full, and they might even thank you for the additional flavor. 1 large Butternut Squash – no need to peel. Preheat oven to 165° C (325° F) and line 2 large cookie trays with parchment paper. Cut Butternut Squash (neck) into slices (see photo) about 1/2 inch thickness. When you get to the seeds, cut through the middle, scoop out the seeds with a spoon and set aside, (see included recipe) continue cutting slices until all the Butternut Squash is sliced. Place the slices on cookie trays and roast for 60 – 90 minutes (cooking time really depends on the size of the slices and your oven). The slices will shrink considerably, don’t worry, it’s all part of the process. Remove the cookie trays from the oven (the slices may appear moist) and turn the slices over. Return the cookie trays to the oven and cook for another 60 – 90 minutes, checking around 60 minutes. It’s essential to keep watching the slices, they can brown very quickly once they are nearly done. Remove and let cool completely on wire cooling rack. Preheat oven to 165° C (325° F) and line cookie tray with parchment paper, lightly misted with non-stick cooking spray. Rinse pumpkin seeds under cold water and pick out the pulp and strings. Place the seeds in a single layer on the baking sheet and bake for about 25 – 30 minutes, or until they are lightly toasted. Check and stir the seeds every 10 minutes. Remove from oven and allow to cool – see storage details below. As with any seeds, feed these Roasted Pumpkin Seeds Treats with moderation. 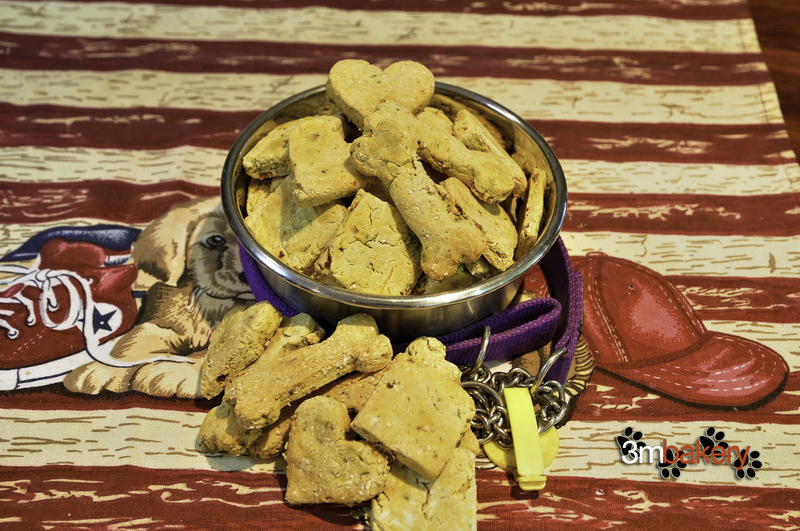 Home-baked dog treats contain no preservatives, so they can mold or spoil the same as home-baked people cookies/cakes do. Other variables, ingredients/moisture content of the treat and climate conditions also determine the storage time. Feed these Roasted Butternut Squash Treats – or – Roasted Pumpkin Seeds Treats only as a treat. Brown Rice Flour is high in protein and contains high levels of B vitamins. If your dog suffers from wheat allergies, it’s a great choice. Wheat and gluten free, Brown Rice Flour is packed with fiber, vitamins and nutrients such as calcium and zinc. Using Brown Rice Flour when baking pet treats, does result in a crunchier treat. Sweet Potatoes are loaded with beneficial antioxidants and nutrients. They are rich in Vitamin A, C and E, Vitamin B1, B2, B3 and B6, Calcium, Iron, Magnesium, Phosphorus and Potassium. They also contain valuable anti-inflammatory nutrients. Bananas are creamy, rich, and sweet to a dog’s palate and provide superior nutrition with several essential amino acids, electrolytes, minerals, vitamins B6 and C, potassium, fiber, and manganese. Dogs recuperating from illness or injury benefit as bananas assist in maintaining normal blood pressure, heart function, fluid balance, and digestive tract function. Parsley is high in Vitamin A and C and provides a number of important health benefits for your dog. It can act to purify blood by accelerating the excretion of toxins from the body, reduce allergy symptoms and blood pressure. Parsley is also a perfect natural breath freshener for dogs. Preheat oven to 165° C. (325° F) and line a large cookie tray with parchment paper. In large bowl, add sweet potato, banana and chicken stock and whisk together. Stir in dry milk, baking powder and parsley. Add brown rice flour gradually, combining with heavy spoon or hands to form a stiff, dry dough. Working with flours that lack gluten can be tricky; the dough crumbles and pulls apart easily, if you find you just can’t incorporate all of the crumbles in the bottom of your mixing bowl, don’t worry, in the next step, you will be able to bring it all together). Turn dough out onto lightly floured (brown rice) surface – make a little indentation in the middle of the dough and spoon those hard to incorporate flour crumbles into the dough. Fold in the sides of the dough, over the indentation and briefly knead and press the dough until it all comes together smoothly. Roll dough between ¼ – ½ inch thickness, and using a cookie cutter or a sharp knife, cut out shapes and place shapes on cookie tray. Repeat the process of knead, roll, cut and place until all the dough is used. If you like, gently press the tines of a fork into each treat. Bake for 40 – 45 minutes (depends on your oven). Remove from oven and place treats on wire cooling rack to cool. Yield about 25 large treats or 50 medium size treats. Feed these Fruit ‘n’ Veggie Treats only as a treat. BROWN RICE FLOUR is Gluten Free, great to bake treats, if your pet has a wheat allergy. Brown Rice is rich in B3, B6 and magnesium and low in fat. PUMPKIN is an excellent source of Vitamin A, potassium, and fiber. The nutrients found in pumpkin help to keep a dog’s immune system strong, thereby strengthening resistance to cancer and other diseases. PARSLEY is a good source of Vitamins A, B, C and K, as well as numerous minerals such as; copper, calcium, potassium, manganese, and iodine. Parsley aids bladder and kidney infections, cleanses the blood, builds the immune system, helps prevents cancer and improves your pet’s stomach and liver functions. Preheat oven to 180° C (350° F.) and line a cookie tray with parchment paper. In a large bowl add mashed pumpkin, chicken stock, egg and parsley. Mix together. Add flour and bacon and mix well using first a fork to combine and then your hands to bring dough together. Turn dough out onto lightly floured work surface and again, using your hands, gently work the dough to form a ball. Working with flours that lack gluten can be tricky; the dough crumbles and pulls apart easily – wrap the dough in cling/plastic wrap and refrigerate it for about 30 minutes – it makes a little easier to work with and roll. Roll dough to about ½ inch thickness and cut with a cookie cutter of your choice or a sharp knife. Place cut outs onto cookie tray and repeat process of knead, roll, cut and place, until all dough is used. Bake for 30 – 35 minutes (depends on your oven). Remove from oven and place Ace’s Pumpkin, Bacon n Parsley Bites on wire cooling rack to cool. Feed Ace’s Pumpkin, Bacon n Parsley Bites as a treat. Chicken is a very good source of lean, high quality protein. Brown rice is an excellent source of fiber, manganese, selenium and magnesium. Brown rice is also less likely to cause dog allergy symptoms. Pumpkin is a fabulous source of fiber for our fur kids. Pureed pumpkin can help dogs and cats with both constipation and diarrhea. Parsley is a rich source of vitamins, minerals, chlorophyll and enzymes. It acts as a tonic, meaning it helps to boost the body’s overall functioning, clearing the bloodstream and liver of toxins. It also acts as a diuretic, great for dogs who are prone to kidney and bladder infections, incontinence, and arthritis. It can help improve bad breath in dogs! Preheat oven to 165° C (330° F.) and lightly grease 2 medium size jelly roll pans. In a large bowl, combine all the ingredients and mix thoroughly to combine. Spread mixture into the greased pans, using a spatula or the back of a desert spoon. Smooth out to about ¼ to ½ inch in thickness. If you don’t mind the mess, use wet hands to spread the mixture, it’s easier. Bake for 60 minutes (50 minutes if your oven runs hot, ovens vary). Remove pans from oven and lower oven temperature to 120° C (250° F). Gently score the Crunchy Chicken and Brown Rice mixture into 1 inch squares, this will make it easier to break the treats apart when cooled. Return the pans to oven and cook for another 50 minutes. Remove pans from the oven and turn the squares over using a food slice or turner. If the underneath still appears a little moist, (it depends on the thickness of mixture when you first spread it into the jelly roll pans) return the pans to the oven for another 10 minutes to thoroughly dry them out. The treats should be a golden in color and crisp/dried when done. Place the Crunchy Chicken and Brown Rice Treats squares on wire cooling rack to cool. Store in zip lock bags or air tight containers for 5 days. Feed these Crunchy Chicken and Brown Rice Treats as a treat.